A few months ago I submitted three family recipes to the SBS Food website as part of a promotion for the upcoming SBS TV series MY FAMILY FEAST, which begins on Thursday, 27 August at 7:30pm on SBS ONE. MY FAMILY FEAST is a weekly half hour television show that will take us into the lives and cooking traditions of Australian immigrants and their families, as seen through the eyes of award winning chef Sean Connolly. • EGGPLANT or ZUCCHINI PARMIGIANA (Milinciani or cucuzzeddi a parmiciana – parmigiana di melenzane or di zucchine). that one of my recipes Sardines a beccafico, stuffed with currants and pine nuts has been cooked by Sean Connolly and will be published as a video on the MY FAMILY FEAST website. I have reproduced a photo of Sean Connolly from the web, therefore I will acknowledge it. Executive Chef and restaurateur Sean Connolly poses at the official launch party for Sean’s Kitchen at Star City on September 10, 2008 in Sydney, Australia. I have been overseas and have only had the opportunity to view three episodes of this adventurous, food series. I was very impressed by Sean’s obvious enjoyment and the respect he demonstrated to the people and the ingredients. I particularly enjoyed the informality of the interaction between the cooks and Sean. Congratulations, and I am sorry that I have not viewed them all. 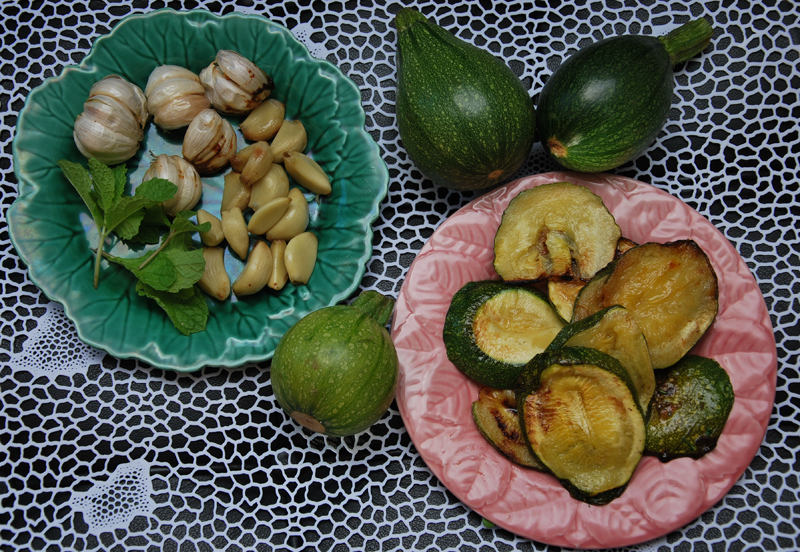 WHAT TO DO WITH A ZUCCA (An overgrown zucchini – a marrow). Those zucchini grow rapidly and before you know it, they become zucche (plural of zucca,) The marrows I am talking about are no longer than 22 cms, still tender and have flavour – any larger than this they become tasteless and dry and are good for the compost. Usually, zucche are stuffed, but these can also be used successfully to make a salad. I use a mandoline (kitchen utensil used for slicing and cutting) to cut the marrows into matchsticks and then use a method similar to the one for making Italian vegetable preserves. Sicilians (and southern Italians) are fond of preserves – the most common are made with eggplants or green tomatoes, sliced, salted, squeezed dry (the next day), then placed in vinegar for a day, squeezed dry and finally placed in oil and oregano. I treat marrows in a similar way, but because I want to eat them fresh it is unnecessary to go through the lengthy process I have described above – the salting process takes about 30 minutes and the rest is completed in no time at all. If I am using zucchini, I slice them long-wise and very thinly (a potato peeler can be good). The following amounts are for processing 1 marrow…..and not too large or seedy. Cut marrow into half, remove seeds. Cut into match sticks or use a mandoline or a turning slicer which cuts into spirals. Place in a colander with salt. Leave to drain for at least 30mins. Squeeze dry. Dress with the oil and vinegar and crushed oregano. Leave for about 10 minutes for the flavours to infuse. Fresh Taste, Simplicity and Low Cost. Sometimes the most simple ingredients make the most sumptuous dish. My friend and I have just been discussing how fresh, young zucchini can make a great pasta sauce. They can be the long, dark green skinned variety or the newer pale green ones. The round zucchini are becoming more common; these can be dark or pale green in colour and some are variegated. Often, when guests come, I remind myself that having costly ingredients is not the most important factor. What is fresh, in season, and have they had it before, are far more important factors. Pasta chi cucuzzeddi fritti (Sicilian), Pasta con zucchine fritte (Italian) is very common all over Sicily and consists of thinly sliced zucchini fried in extra virgin olive oil. Garlic is used to flavour the oil and is then discarded. It is important to fry the zucchini in plenty of oil in a wide frypan – the zucchini will release liquid if they are overcrowded in the pan and if necessary fry the zucchini in batches. My partner took some left over zucchini pasta to work and I was amazed when he reported to me that one of his collegues referred to this vegetable as tha blandest vegetable! I think I will need to invite this person to dinner. Thin spaghetti is the favoured pasta for this dish – a coating of flavoured oil is preferred. Short, tubular or ridged, surfaced pasta may trap too much oil. Like so many of the vegetable paste sauces it is made in minutes and makes me wonder why takeaways are seen as a quick solution. Heat the oil in a wide frypan and add the garlic. When it is golden discard it. Ensure that the oil is very hot and add the zucchini – this will seal the surfaces. You could do this in a couple of batches but keep the oil very hot and add fresh oil to fry each batch. Turn and toss till golden. Place the fried zucchini into a bowl and add salt ( the salt is added at this stage otherwise the zucchini would have released their liquid). Cook the pasta in salted water till al dente and drain. Toss zucchini, oil and pasta together and add plenty of freshly ground pepper. Serve with abundant freshly grated cheese and pepper. · After the zucchini have been fried and set aside, reheat the oil (or add more), add about a cup of chopped parsley and 2 cloves of chopped garlic and fry this mixture for a few minutes before adding it to the pasta. · For a favourite summer dish add a dollop of tomato salsa and fresh basil on top. · Add a dollop of ricotta either with or without the tomato salsa. · Chopped mint sprinkled on top of the dressed pasta is probably not traditional, but I like to do it – it accentuates the fresh zucchini taste. And by the way… the ini at the end of any Italian word (zucchini) means small, those bigger than a finger are zucche (marrows). Pick them young as they are intended to be.